I do not have pups available right now. I expect to have pups born later this year; I think most of them have been spoken for but until I know how many pups I have available I can’t really know that. I expect to have pups in 2019 from Meadowcroft Blush x Benson Ranch Bonavento, and possibly out of Benson Ranch Cameo or Benson Ranch Sarika bred to Stoneybrook’s Milan. Seven month old Marquise and Armani enjoying life! I am committed to doing my best for my dogs and that includes seeing that they have contented and productive lives. 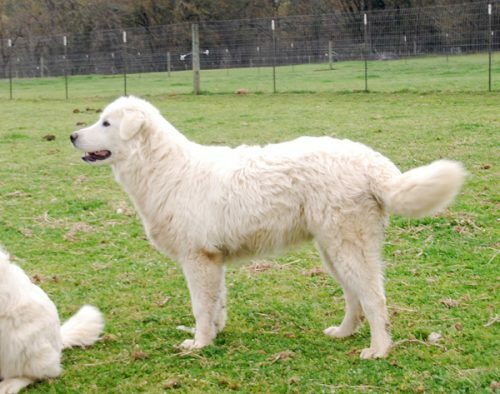 I absolutely know that the quality of life for a Maremma allowed to work with a partner is hugely improved from that of a single dog. 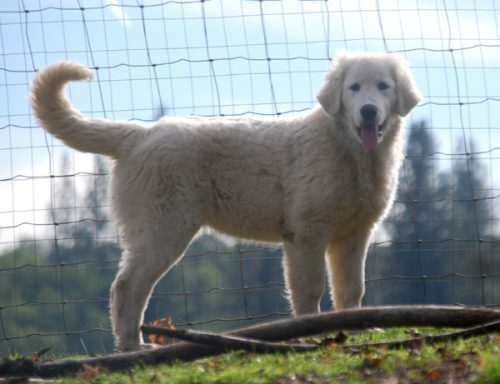 Maremmas allowed to work as pairs bark less, climb or dig under fences less, and play with livestock less. Predators are much less likely to take on a formidable pair of dogs, and if attacked two dogs are much more likely to survive the encounter. Livestock are better protected by a pair of dogs because they are never left alone. 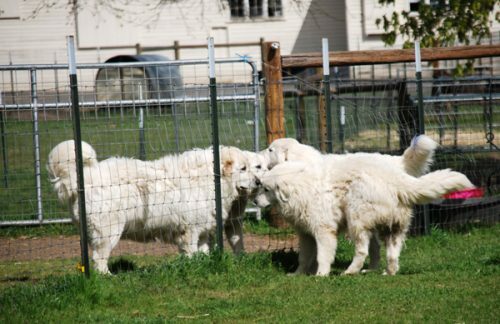 Maremmas know they are to stay with their livestock AND do perimeter checks. A single dog cannot do both and must chose which to do. Patrolling perimeter fencing deters predators, but when a single dog does this the livestock are left unprotected. Predators know this. 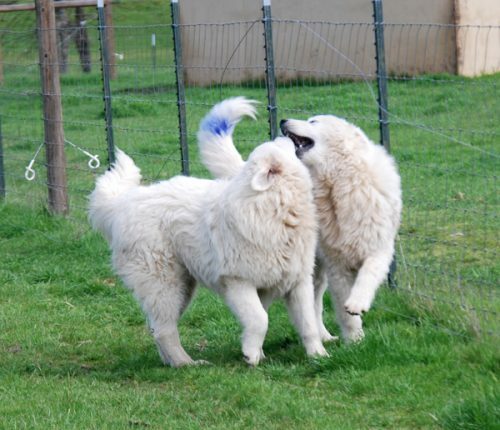 When Maremmas work in pairs one dog stays with the livestock while the other does patrols; if there is a problem the patrolling dog will sound the alarm and his partner will rush to his aid. It’s a wonderful system; for the owner, the livestock, and for the dogs. Maremmas live their lives in service and are prepared to give their lives to this end. I see it as a minimum requirement of an owner of any of my dogs to do their very best to create an OPTIMAL living situation for my dogs. One of those elements is allowing the dogs to work as pairs. I am fine with placing a single dog in a home that already has a working guardian dog. I can also help a potential buyer locate a suitable partner for one of my dogs if I don’t have a bonded pair of dogs available. I will not place any of my dogs in a living situation where they will be asked to work alone. I am completely, absolutely firm on this. I have had many potential buyers contact me asking if I will make an exception for one reason or another. I will not. I want my dogs to have a comparable working partner. This doesn’t mean a dog to talk to across the fence, or a pup of mine working with an LGD too advanced in years to work and play with my pup. I love my dogs. I am committed to giving them my very best effort when considering placing them in a new home. I am never in a hurry to place my pups. If the right situation doesn’t come along the pups can stay right here for the rest of their lives. My relationship with my Maremmas is one of the passions in my life. My position regarding pairs is based on significant experience with this breed. On my “Why Benson Ranch Puppies Are Special” page you will find a list of references from people who have purchased pups from me. Any of these buyers would be happy to give you their perspective on the pairs situation now after having lived with it. This photo was taken April 10, 2018 when Lili’s pups were almost seven months old. Lili is in the left foreground, with three of her male pups. 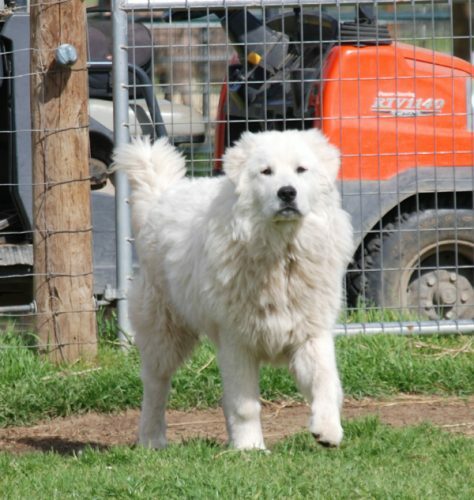 Lili weighs 130 lbs – these pups are going to be big dogs!! This project has been a lot of work – and expensive – but it has also been affirming. I am so proud of the scores these pups came away with and happy to know that as I place them with new owners I am not sending hip dysplasia out there for an unsuspecting buyer to deal with. My thought had been that if any of my pups had problems I would keep those pups here with me. Obviously, per the scoring, I use PennHIP testing. On the bottom of the PennHIP certificates you can see a grey area. That is where typical Maremma scores fall. Periodically the scores of all Maremmas tested via PennHIP are compared and the average scores for the breed change, hopefully with a shift to the left. As we, as breeders, produce more pups with scores as high as the ones awarded my pups the average scores for our breed should continue to improve, which is a major reason this testing is so important in my opinion. As you might guess I am very excited and proud to have produced a group of pups of the quality these are. It takes a lot of time and money to build a high quality breeding program. Results like these are part of why that effort is worth it, again, in my opinion. 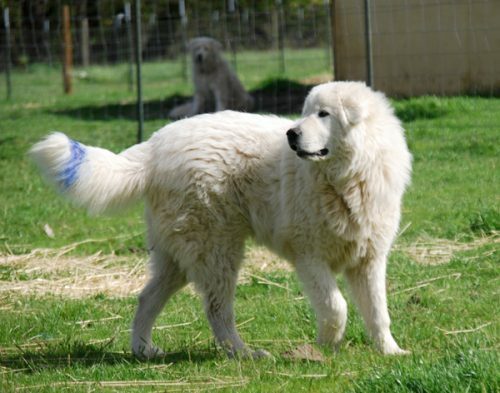 When I began building my breeding program only 5% of the registered Maremmas in the US and Canada had had their hips tested/certified, via OFA or PennHIP methods. I have had hip certifications done on nineteen Maremmas. I am proud to be she who has hip tested the most Maremmas! But even with all of that the scores these Lili pups have are amazing. The fact that there is such consistency in the litter is soooo impressive. The likelihood of an animal to reproduce traits in it’s offspring lies with the genetic background. Breeding only dogs with good hip testing scores is a very good way to improve the quality of the hips in the breed, but with genetics nothing is black and white. Two very good dogs can still produce a pup with problems. The more that is known and proven about the quality of the genetics in the background the more probable it becomes to be able to predict the quality of the offspring. Genetics fascinates me, as you may have noticed given this big speech. At present I am the secretary of the Maremma Sheepdog Club of America. I can tell you that the tide is changing. More and more buyers are putting pressure on breeders to do health screening with their breeding dogs. In 2017 the Code of Ethics breeders of MSCA went from three to ten, and I know more breeders are working on testing their breeding dogs and making the commitment to being ethical and responsible breeders. This litter of pups have all been placed in their new homes or are staying with me. In 2019 I will breed Meadowcroft Blush (PennHIP .20 & .20) to Benson Ranch Bonavento (PennHIP .18 & .16) and will do this all again. Stay tuned…!